IQS Directory provides useful search tools to find leading static mixer manufacturers and suppliers. Find static mixer companies that can design, engineer, and manufacture static mixer to your specifications. Peruse our website to review and discover top static mixer manufacturers with roll over ads and complete product descriptions. Connect with the static mixer companies through our hassle-free and efficient request for quote form. You are provided company profiles, website links, locations, phone numbers, product videos, and product information. Read reviews and stay informed with product new articles. Whether you are looking for manufacturers of inline static mixers, alumium static mixers, and stainless steel static mixers of every type, IQS is the premier source for you. The Admixer series of sanitary static mixers and blenders is perfect for food, beverage & dairy processing. The Admixer delivers a 100% product uniformity and distribution from controlled shear and turbulence. It meets 3-A Standard #35-04 and is designed to process flow streams from 0.25 to 250+ GPM. The Admixer blends most combinations of flow, viscosity and density even from multiple incoming streams. Visit admix.com/admixer-static-mixer for a free quote. Static mixers do not have any moving parts but use carefully designed ribbon-like obstructions within a cylinder to force the flow of material to mix and blend together. They are also known as inline mixers and are used in production or processing lines where a continuous flow of material is more advantageous than batch mixing. That is, static mixers can mix a constant and steady stream of liquids, allowing for faster mixing and smooth operation. Static Mixers have an axis and attached ribbons or blades which are generally contained in a horizontal semi-cylinder of stainless steel or aluminum alloys. Titanium, thermoplastic and Teflon are also frequently used materials. For food and beverage applications, stainless steel is the material of choice because of its corrosion-resistance and non-porous characteristics. Static mixers have total mechanical reliability because there are no moving parts or electrical connections that would require service and installation is simple. They save costs over mechanical mixers because they have zero power consumption. Because of the simple arrangement of stationary blades inside, static mixers are sanitary and easy to clean. Static mixers are widely used in many industries including the cosmetic, pharmaceutical, chemical, agricultural, pulp and paper, automotive, water treatment, adhesive and sealant industries. 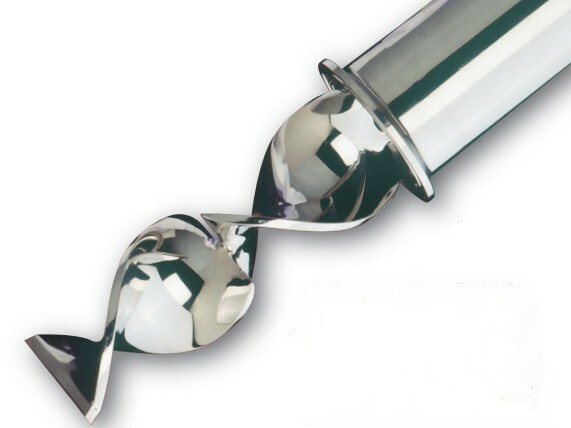 They are particularly effective when used with liquids or materials with very low viscosities. Static mixers are simple but must be engineering correctly so that the fluid divides, mixes, divides again and mixes again until completely blended. Static mixers allow the fluid to continue mixing as it flows through the mixer. These mixers are able to offer a high level of control over the degree of mixing; depending on the desired outcome, some solutions will be completely homogenous while others will be less precise. Before flowing through the mixer, most static mixers reroute the fluid, although some instead strengthen the force and pressure of the mixture. Two main factors to consider when selecting a static mixer are the type of materials being mixed and the mixture speed that will be used. Static mixers are favorable choices for neutralization or other chemical reactions involving liquid/liquid or liquid/solid constituents. A variation of the static mixer is to have flat paddles protruding from the axis instead of ribbons. Paddle mixers may also be used as agitators with moving parts, however. Other mechanical mixers include drum mixers, in which a gallon drum is rotated and tumbled to mix the contents within, emulsifiers, which blend two immiscible substances, high shear mixers, which create particles of uniform size and shape, and many more. Static Mixers - Admix, Inc.